I’ve recently embarked on a learning journey with VMware’s NSX network virtualization product as part of a group of individuals focused on running through the hands-on, expert level certification for NSX. Early on, I decided to document my experience on the blog. More often than not, Wahl Network ends up being my second brain and I refer to it often. This series, entitled Working With NSX, will focus on the administrative side of NSX in various lab environments. To kick things off, I’m going to walk through the initial setup and configuration of the NSX Manager, which is a required first step. The NSX Manager OVA deploys without much fuss. 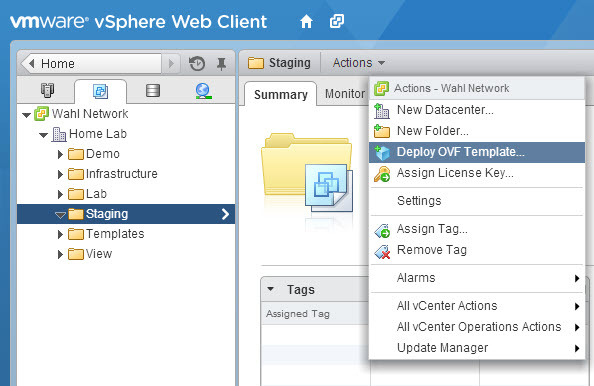 I have a Staging folder used for any new workloads; let’s select that folder from within the vSphere Web Client and deploy a new OVF/OVA template as shown below. Next, navigate to the location of the NSX Manager OVA file, which I have located on an SMB share that sits on my Synology array. Now that the wizard has access to my OVA file, it’s time to begin walking through the long list of placement questions. I would advise checking the box next to “accept extra configuration options” so that you can provide the custom fields for passwords, IPs, and the like towards th e end. I’ll skip past the mundane questions that request a name, folder, cluster, datastore, and network – these will vary depending on your environment and are nothing special. Section 2E of the wizard, called Customize Template, includes the special fields that must be completed. Make sure to pick a snazzy password that you will also remember (or stick inside of a password vault). Once done with item 2E, advance to the ready to complete screen and click finish. That’s it. NSX Manager should now be deployed into your environment. If you haven’t already, power it on. NSX Manager uses 4 vCPUs and 12 GB of RAM out of the box. I’ve lowered that to 8 GB of RAM in my environment without any noticeable detriment. 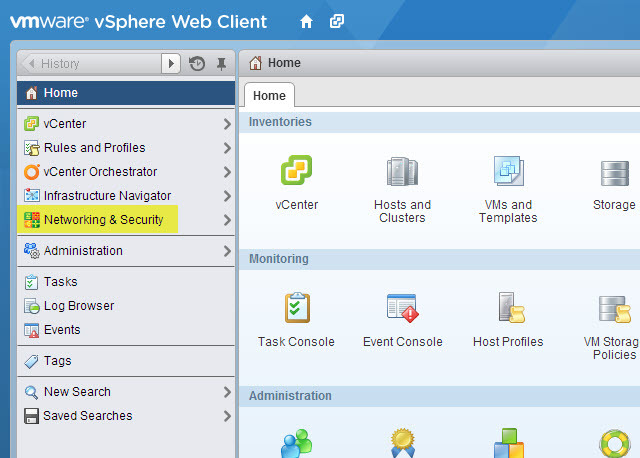 From the main menu, select Manage vCenter Registration. There are two entries that should be filled out, although only one is mandatory. You’re done. 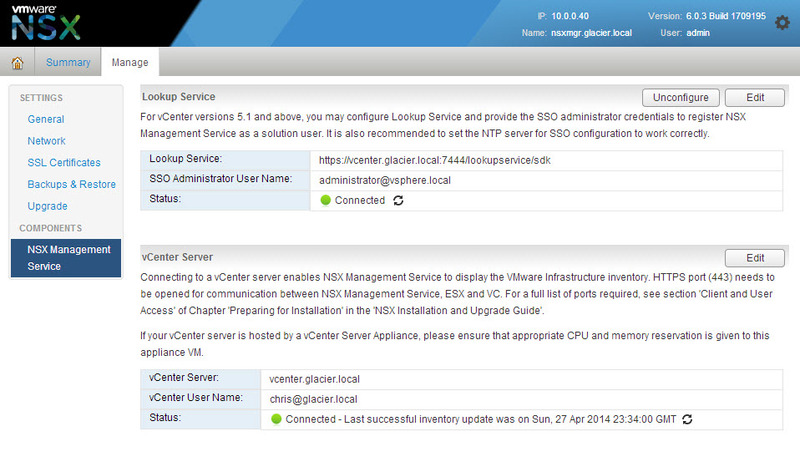 Feel free to wander around the NSX Manager GUI for a while, but there’s nothing else to do here. The vCenter Server will light up for a few minutes as the NSX bits are loaded. My little HP Microserver G7 took about 10 minutes to completely finish the process. Just be aware that it happens. I logged out of the vSphere Web Client and then back in; once completed, this little Networking & Security gem was waiting for me. There’s also an icon in the Home Inventory section. From within the Networking & Security section, click on the Installation menu item and then select the Management tab (the default one). 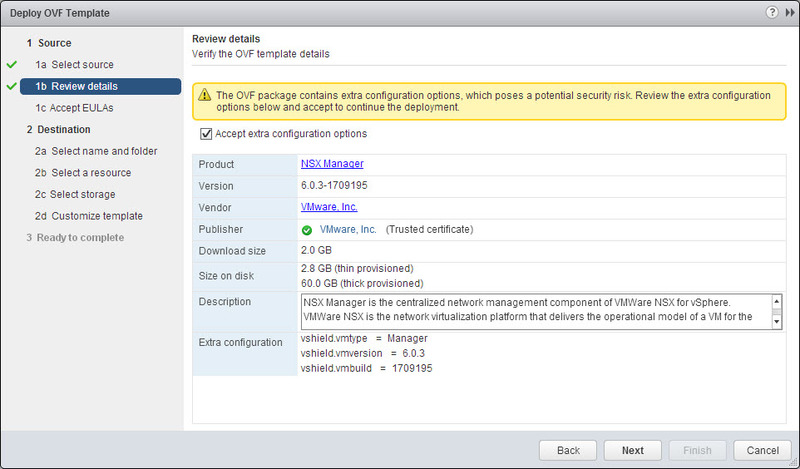 Make sure you see the new NSX Manager added to your inventory. Mine took about 15 minutes total to show up, but my management ESXi host is rather slow. 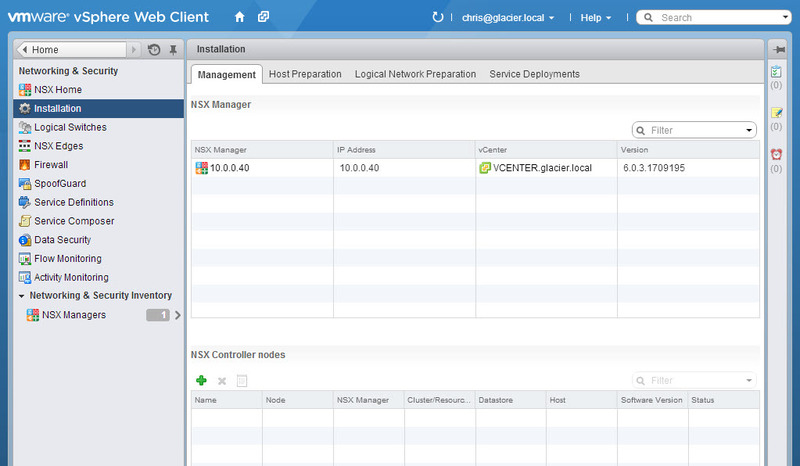 NSX Manager is now up and running and ready to do your bidding. The next section focuses on Assigning User Permissions. A little OT, but I like that there’s a glimpse of your folder layout in the first pic. Given your level of expertise I’ve been curious for a while now to see how you break out your VM folder structure / resource pools, and simply what VMs you run where 🙂 The sneak peek isn’t too telling as they’re not expanded, but nice to see. Cheers. waiting for the nsx controller portion. btw, is the edge router side which perform the function of DR/DFW/VXLAN/Security are on the esxi host kernel side, then it does not need any deployment/provision. Excellent starting point. Thank you. Great starting point for first time users of NSX. Looks to be pretty easy to deploy. for a production would you recommend a dedicated cluster, or just install it into an existing cluster. 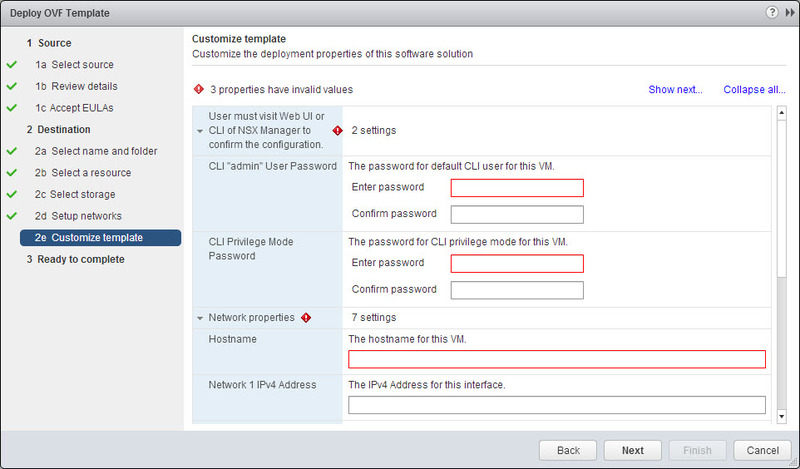 Great article on how to install nsx even I can follow this. Great guide – I can help you if you need a hand andynashers! Good article! Thank you for sharing, will try it in my lab soon. Awesome post, thx for the very detailed guide! Found some new things even for second read. Chris, can you briefly elaborate why you would configure the lookup service on manager? Is that to enable authentication of users stored in other identity store like AD to access the manager admin interface? Interesting to see that NSX can run on home lab hardware. I’ll need to keep following along in the series, but I’m wondering if there are any limitations if the home lab doesn’t have any NSX compatible networking gear. Will there be NSX functionality that you’ll miss out on? As long as you can create VLANs and support an MTU > 1600 bytes, you’re good to go. Great article, thank you for taking the time to document this. NSX is something I am hoping to get more hands on experience with. This is a very useful series. Do you know if it is possible to register the vCenter via the API, I can’t seem to see anything in the docs but it will make automation a lot more complicated if not! I haven’t tried it, but PUT https:///api/2.0/services/vcconfig looks promising. Nice series!!! This series guide to me in the right point.